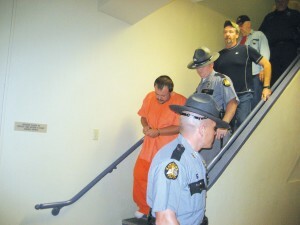 A notice of intent to seek the death penalty has been filed in Estill Circuit Court against two accused murderers. Commonwealth Attorney Heather Combs revealed last week that she is seeking the death penalty for Leonard Henry and Opal Ashcraft if they are convicted of murdering Henry’s mother and brother. Henry, 27, and Ashcraft, 21, are accused of shooting Katherine Gray Henry sometime in late July and dumping her body in a remote wooded spot in Lee County. 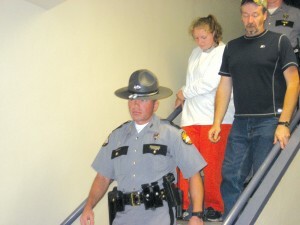 Kentucky State Police found her body wrapped in a sleeping bag. It was identified by Kentucky State Medical Examiner Dr. Emily Craig. Detective Ken Bradley got a search warrant for the victim’s home and found the body of 41-year old Paul Richardson in a freezer. He, like his mother, was shot in the face. Bradley stated on his report that the accused confessed to the murders and admitted they were both involved. During a preliminary hearing in Estill District Court, Bradley said that Leonard Henry told him the murder weapon was a 22 caliber single shot rifle and that he had sold it. Bradley recovered the gun. Bradley said Katherine Henry, 66, had also been stabbed in the arm and chest. He said that blood evidence in the house indicated she had been shot while lying on the couch. Another pre-trial is scheduled for Jan. 8. “There is no guarantee that they will get the death penalty (if they are convicted), but asking for it also makes life without parole an option, not available in a regular murder case,” Combs said.